7/11 post March-7 monthly faves! My 7/11 post each month is my version of the monthly favourites. I pick my current 7 favourite products and post on the 11th every month-simple! Seems like black packaging was the flavour of the month this month-unless you're from La Roche-Posay! I picked up some Easter gifts today from Godiva and these little Easter eggs fell into my bag too! I love Godiva-these chocolate eggs are filled with praline and chocolate mousse! Two skincare products are in my favourites this month-Effaclar Duo from La Roche-Posay and Mac Prep and Prime Natural Radiance Primer. So in all honesty I have been getting a bit jaded with beauty bloggers all seemingly talking about the same products at the same time. This years hot favourites so far seem to be the Revlon Nearly Naked foundation, Rimmel Apocalips, Mac Archies Girls, Illamasqua speckled polish and Benefit Fine One One and yes I love reading about new things but sometimes I just think there has to be established products that are still great but don't get lots of exposure because it's all about the newest thing to launch (and get paid for I presume for promoting it). I do not have an issue with this at all but I hope this post has both some new and old products in it that are great. But, admittedly one of the bandwagons I have jumped on is the Effaclar Duo from La Roche Posay one. La Roche Posay is a french company specialising in skincare-its readily available in Boots and it's readily available in Dubai at most of the pharmacies here. It's also not hugely expensive either. Since the beginning of the year my face and I have totally fallen out, I've mentioned this before in a previous post but I've pared my skincare right back at the moment to try and settle it and am using just 3 products in my cleansing routine-the Shu Uemura balancing cleansing oil, Effaclar Duo and once a week the Aesop Chamomile Anti Blemish mask which I blogged about here. Effaclar Duo is a corrective and unclogging moisturiser designed for daily use. The product combines four active ingredients that tackle the two main symptoms of imperfection prone skin: Niacinamide and Piroctone Olamine to fight against a build up of bacteria which lead to imperfections, and LHA and Linoleic Acid which unclog blocked pores. The formulation is further enriched with the La Roche-Posay thermal spring water which reduces irritation and redness. The first evening I used it I woke up with really red skin-it looked like I was sunburned! I had read this could happen to some people so I stuck with it and the redness went in 24 hours. I don't find this moisturiser to be drying at all and in the first 3 weeks using it I didn't get one new spot. Then I went to Cairo last week and the change in water meant I am fighting with my face again-but I will stick with it. It's a light gel cream, easily spreadable and sinks in immediately-it also works well for a base for make up. 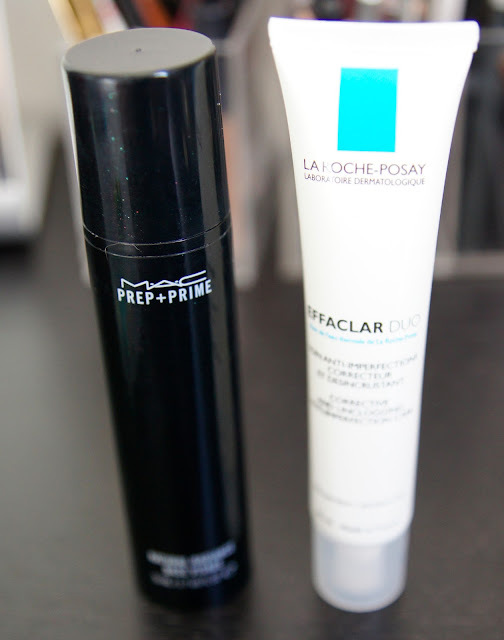 My next favourite this month is the Mac Prep and Prime Natural Radiance Primer. This came out last year and I picked it up but I didn't use it until recently. I have a thing about using the same brand primer as the foundation you are using and as I am currently using a Mac foundation I dug this out. This primer is a liquid balm-a cross between the Clarins Instant Smooth primer balm and Clarins Beauty Flash Balm in texture. It applies colourless to the skin and I smooth it on rather than rubbing it in so it sits on the skins surface. I then try to wait a couple of minutes before then applying foundation. It contains vitamin E and C, caffeine and illuminating pearl powders. I really feel this helps to prolong the wear of my foundation, I apply my powder less often and it makes the skin feel really soft and hydrated. Christine at Temptalia rated this an A product so that's pretty much a must buy for me. When I first tried it though I thought 'I don't get it'. It's taken a few days use for me to love it-and I really do love it. Christine does such a great review here and everything she says is spot on. It's a strange texture-it's difficult to get product from the pan as it's so compacted. I use a short haired kabuki brush for the best result. It's almost invisible on the skin but it gives this wonderful sheen-more subtle than a highlighter but definitely detectable in the right light. I have been using a colourless Illamasqua loose powder to set foundation and I worry sometimes it makes me look ashen but this Nars one doesn't. I agree with Christine though that you must use a dry brush to apply the powder and I suspect that water or oils from your fingers will harden the surface of the compact if you touch it repeatedly. I love this product for setting make-up. One of my clients in Cairo commented how nice my make-up looked-I've known her for 2 years and met her probably 12 times and she's never said anything before so I took that as a compliment! The one downside-I hate the Nars packaging. The rubberised matte black just gets filthy so quickly. Two lash products are in my March favourites-the first is Lancome Hypnose Star mascara. I've never had a product in 2 consecutive favourites posts but this mascara was indeed also in my Febraury 7/11 post I won't review it again as you can click the link to read my thoughts last month but I really love this mascara-it does everything you want a mascara to do and the packaging is amazing. If anyone asks me for a mascara recommendation at the moment this is what I tell them to go out and buy. This is a white undercoat you use on your lashes before applying your mascara. It goes on white but dries clear. It's quite a fine texture so doesn't clump your lashes. I tend to apply to one eye, then the other and then immediately apply my mascara to the first eye so the lash primer hasn't really dried properly and is still wet. The undercoat intensifies the build and lengthening qualities of whatever mascara you put on it. I have also found that it stops mascara smudging throughout the day and I don't need to do any under eye clean up throughout the day when I wear this. The last 2 products are both make-up, a blusher and a Mac lipstick. I saw this Givenchy Le Prisme blush , I think on British Beauty Blog but then it didn't come out for aaaaaaaaaaaaaages and I finally saw it at Dubai airport months later-and of course I snapped it up. And then I opened it and I was disappointed. The colours were really pale and I thought it would make me look really washed out. So it went in the back of a drawer for months. With my recent organisation of my make-up collection it came out again and I decided to try it-and wow it is amazing! Yes it is quite subtle but it gives a beautiful rosy glow to the skin. It's perfect for spring and it's perfect for daytime. 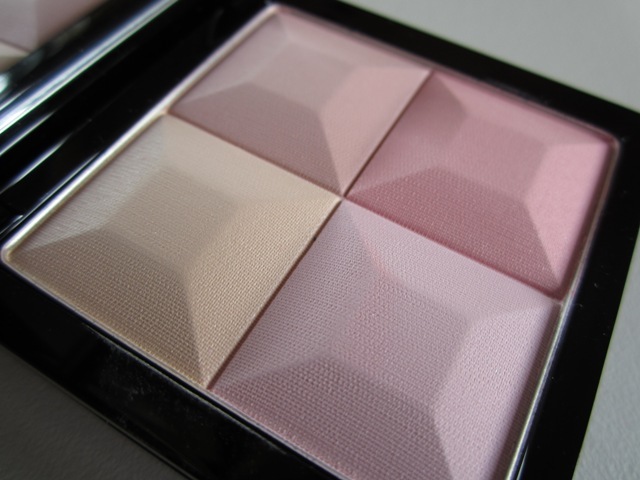 No sparkle or glitter in this blush-just beautiful, healthy rosy cheeks. Alas, I think it was limited edition but Givenchy do a lot of these 4 colour blushes and I highly recommend you scoot down to your nearest Givenchy counter and swatch one because the texture is beautiful. My final favourite is Mac Chatterbox. This is from the Amplified range which I find to be very moisturising and long lasting. Chatterbox is a blue based neutral pink-bright enough to make an impact but without being totally in your face. I love getting inspiration from other favourites posts so please do link me to yours by leaving a comment below! Ahh, I'm so glad I'm not the only one who's been thinking that they're sick of seeing the same products being reviewed and ranted about! I totally get why, but...it gets a bit much. I really want to jump on the Effaclar Duo bandwagon! And the NARS Light Reflecting Powder has also been reviewed by another favourite blogger of mine and I am just so tempted to buy it. You can follow my blog on Bloglovin!